Leading Manufacturer of weight loss medicine and weight loss kit from Agra. Each Capsule of Medhoslim is of 850 mg. each capsule contains many Ayurvedic and herbal ingredients including Vrikshamla (Garciniacambogia), Shilajeet (Asphaltum), Chitrakmool (Plumbagazeylanica), Guggulu (Commiphoprawightil), Triphala (Amla, Harad, Beheda), Pipali (Piper longum), Kutki(Picrorhizakurrao), Babool(Acacia Arabica), Shunthi (Zingiberofficinale), Nishoth (Operculinaturpethum), Mustak (Cyperusrotundus), Vidnaga (Embelicaribes). The fruit of medhoslim is eaten with the help of stick. It gives a curvaceous and healthy body to its users. Medhoslim is also used to slow down the process on carbohydrate conversion in body fat. Medhoslim is also recommended and included in fast weight loss plans by famous dieticians. Medhoslim helps in suppressing excessive crave for food due to existence of Garciniacambogia (vrikshamla) in it. If Medhoslim is consumed with regular physical activities including yoga, exercise and morning walk and also along with a balanced diet with salad, vegetables and fruits then it reduces fat and problems of obesity with 100% assurance. Medhoslim is used to treat fat issues of human body. It can also be increased appetite for sometimes but after few days appetite is reduced automatically. It is also used to treat high cholesterol level in human body. 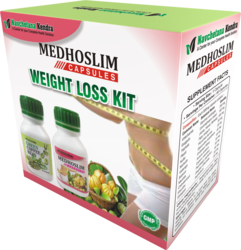 Medhoslim also helps in promoting and stimulating healthy metabolism and helps in burning the extra fat in body. Medhoslim is also used for reducing belly fat naturally and facial fat, Kapha related disease and other ailments. It is also used for belly fat, loss of energy and heaviness in human body after meal. It can also be used to treat laziness or lethargic condition. Medhoslim also helps in treating inactiveness, breathing problems due to heavy body. It is also used for treating excessive sleep. It also helps in reducing tiredness in body and hunger. Medhoslim is also used to boost mental alertness, stamina and energy level in human body. Medhoslim can also be used for maintaining the healthy level of blood sugar and healthy functioning of heart in human body. It contains Triphala as one of the ingredients that helps in getting rid of stomach upset and other stomach related problems. History of Green Coffee: - Before 1000 AD, East African Tribes would make a paste by grind the coffee berries and mixed it with animal fat. Green Coffee beans were also used as food from ancient times. It grew naturally on African Peninsula. The seed part of Coffee berries is known as Green Coffee. Having hypertensive effects in body, the green coffee extracts also regulates the blood pressure. Other names of Green Coffee:- Cafe Marchand, Coffea arabica, GCE, Coffea bukobensis, Coffea liberica, Coffea robusta, Coffea arnoldiana, Extrait de Cafe Vert, Extrait de Feve de Cafe Vert, GCBE, Feves de Cafe Vert, Green Coffee Powder, Poudre de Cafe Vert, Feves de Cafe Vert Arabica, Feves de Cafe Vert Robusta, Svetol Robusta Green Coffee Beans, Green Coffee Beans, Cafe Verde, Cafe Vert, Green Coffee Bean Extract, Green Coffee Extract, Raw Coffee, Coffea canephora, Raw Coffee Extract and Arabica Green Coffee Beans. Dosage Take one capsules 3 times daily or as directed by your physician. Medhoslim is an Ayurvadic herbal medicine which is used to treat obesity.Losing weight is not easy,But Medhoslim seems to be a miracle product for reducing weight within few weeks. It is condidered as natural weight loss remedy.Medhoslim can be found in the form of capsules in market.Each container of Medhoslim cantains 60 Capsules.It is widely spread medicine for losing fat from body.It is a native of Mexico.Medhoslim contains many herbals ingredients such as Shilajeet,Pipali,Plumbagazely lanica,shiajeet,Amla,Baheda,Harad and many other Ayurvadic extracts.Babool is also included as an ingredient in Medhoslim which help in therapeutic treatment.